This article is about the American football player. For the English football (soccer) player, see Matt Bryant (footballer). For New Zealand water polo player, see Matthew Bryant (water polo). Steven Matt Bryant (born May 29, 1975) is an American football placekicker for the Atlanta Falcons of the National Football League (NFL). He was signed by the Frankfurt Galaxy as a street free agent in 2002. He played college football at Baylor. Bryant was born in Orange, Texas. He played football and baseball at Bridge City High School in Bridge City, Texas and holds the record for the longest field goal. After high school, Bryant attended Trinity Valley Community College in Athens, Texas where he was a two-time NJCAA All-American and a member of the 1994 national championship team. He then signed with Oregon State University and later transferred to Baylor University, where he played in the 1997 and 1998 seasons and ranks seventh in the all-time scoring list with 105 points (21 field goals and 42 extra points). Bryant's 21 field goals place him fifth in Bears history. He also set the school record with a 100 percent success rate when he hit 42-42 extra points. After graduating, Bryant went undrafted and worked at a pawn shop, then as a personal trainer. After not being selected in the 1999 NFL Draft, Bryant signed with Iowa Barnstormers of the Arena Football League on November 17, 1999 after the 1999 season but was cut on April 4, 2000 before the regular season began. On January 9, 2002, Bryant signed with the NFL's New York Giants, who allocated him to the NFL Europe's Berlin Thunder on March 15. On March 30, the Thunder placed Bryant on injured reserve, and the Thunder cut Bryant on May 10. The Giants then reassigned Bryant to the Frankfurt Galaxy. Bryant never played for either NFL Europe team due to a quadriceps injury. Originally signed by the New York Giants in 2002 as a free agent, he remained until he was cut by Tom Coughlin in the coach's initial season with the team. After that release, Bryant played one week with the Indianapolis Colts and then 3 weeks with the Miami Dolphins. Bryant was signed as a free agent by the Tampa Bay Buccaneers prior to the 2005 season. On October 22, 2006, Bryant successfully converted a 62-yard field goal as time expired in Tampa Bay's 23-21 victory over the Philadelphia Eagles. The field goal was the second longest in NFL history (at that time), behind the 63-yarders kicked by Tom Dempsey in 1970 and Jason Elam in 1998. Sebastian Janikowski and David Akers have since kicked 63-yard field goals. Matt Prater holds the NFL record with a 64-yard kick in 2013. On October 23, 2006, in response to his 62-yard field goal, Mayor Pam Iorio declared October 23 to be "Matt Bryant Day" in Tampa, Florida. On September 5, 2009, the Buccaneers released Bryant and replaced him with Mike Nugent. Prior to the start of the 2009 season, the Florida Tuskers signed Bryant to a contract. 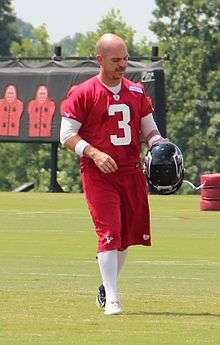 Bryant was signed by the Atlanta Falcons on December 1, 2009, to replace kicker, Jason Elam. In the 2012 divisional playoffs against the Seattle Seahawks, Bryant kicked a game-winning 49-yard field goal to send the Falcons to the NFC Championship Game. On September 7, 2014, Bryant became the 4th player in NFL history to kick a 50+ yard field goal with less than a minute remaining in regulation to force overtime in addition to converting a 50+ game-winning field goal in overtime against the New Orleans Saints. On November 9, 2014, against the Tampa Bay Buccaneers, Bryant was four-for-four on field goals, which marked the 9th time in his career he’s made 4 field goals in a single game. He also made two extra points which pushed him over the 600 point mark (601), making him the second player in Atlanta Falcon history to reach 600 points. On November 16, 2014, against the Carolina Panthers, Bryant was four-of-four on field goals again. This marked the 10th time in his career that he made four field goals in a single game. On November 30, 2014, against the Arizona Cardinals, Bryant connected on a career high 5 of his 5 field goal attempts. On September 14, 2015, Bryant kicked a game-winning 47-yard field goal against the Philadelphia Eagles. On October 11, 2015, Bryant only connected on two of his four field goal attempts against the Washington Redskins. His streak of 28 straight made field goals was the second-longest in team history behind his stretch of 30 consecutive field goals between 2010 and 2011. On October 15, 2015, Bryant connected on all three of his PAT attempts against the New Orleans Saints, becoming the second player in franchise history to eclipse 700-career points with kicker Morten Andersen (806). On December 11, 2015, Bryant was placed on injured reserve. Bryant was named NFC Special Teams Player of the Month for October after converting 11 of 12 field goals and all 17 extra points. Bryant participated in 2002 United Way Hometown Huddle by conducting a football clinic at the Highbridge Center for members of Alianza Dominicana, a local United Way agency that services families in Washington Heights. He visited the Keller Army Community Hospital at West Point to participate in the Foundation for Hospital Art’s Paintfest 2003. Bryant drinks a chocolate milkshake on the night before each of his football games. He also is known for squeezing his size 10.5 foot into a size 9 kicking shoe for games, believing that curling his foot to strike the ball in the same way that someone makes a fist with his hand before punching increases his distance and accuracy. Matt is married to Melissa and the couple have seven children. On September 24, 2008, their youngest son Tryson died in his sleep, age three months, apparently from sudden infant death syndrome (SIDS). Despite that tragedy, a day after his son's funeral, he returned to play and kicked three field goals for the team to beat Green Bay Packers, having kicked the game-winning field goal the week before against Chicago Bears in overtime. After the season, Matt and Melissa established the Matthew Tryson Bryant Foundation to raise awareness for SIDS. Proceeds go to the March of Dimes. 1 2 3 4 Asher, Matthew (2012-10-09). "The Road Less Traveled: Falcons Kicker Matt Bryant Has Seen It All". CBS Atlanta. Retrieved 2013-01-13. ↑ "Matt Bryant". New York Giants. Archived from the original on August 12, 2004. ↑ Gola, Hank (2012-01-06). "Giants Atlanta Falcons Matt Bryant is still kicking after NY Giants signed the former Texas pawn shop worker in 2002". New York Daily News. Retrieved 2013-01-13. ↑ "Saints vs. Falcons – Game Recap – September 7, 2014". ESPN. Retrieved 2016-01-01. 1 2 3 4 "Matt Bryant 2015 Bio Update" (PDF). ↑ "Falcons vs. Buccaneers – Game Recap – November 9, 2014". ESPN. Retrieved 2016-01-01. ↑ "Falcons vs. Panthers – Box Score – November 16, 2014". ESPN. Retrieved 2016-01-01. ↑ "Cardinals vs. Falcons – Box Score – November 30, 2014". ESPN. Retrieved 2016-01-01. ↑ "Eagles vs. Falcons – Game Recap – September 14, 2015". ESPN. Retrieved 2016-01-01. ↑ "Falcons place Matt Bryant on injured reserve". Retrieved 2016-01-01. ↑ Stroud, Rick (2008-09-25). "Son of Bucs kicker Bryant dies". Tampa Bay Times. Retrieved 2013-01-13. ↑ "Page Not Found – Tampa Bay Times". Retrieved 23 October 2016.